First, Happy Birthday to Mr. Poe, who was born January 19th, 1809 in Boston, one of my favorite cities. He died in Baltimore, the place of my birth. 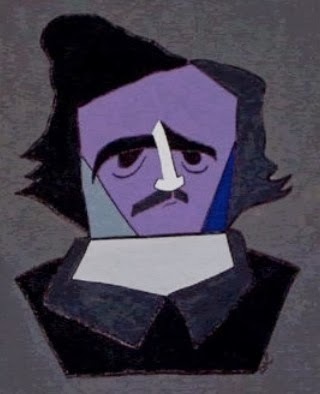 The image above is a painting I did of Poe maybe ten years ago. I was busy doing paintings of magicians at the time, and I had a book, The Collected Works of E.A. Poe, on my shelf and it was sitting in such a position that I could see Poe's face every time I looked at the shelf. One day, I grabbed a pencil and my sketch pad and jotted down the sketch that would later become my painting. For years, the Poe painting was the ONLY none magician painting I had done. Now, it appears that Poe is about to find his way into my new show The Steampunk Illusionist. Where exactly, I'm not at liberty to say. But I am about 99% certain it won't have anything to do with The Raven. I'm quite thrilled with the direction the routine is taking. Perhaps once we debut it, we can post a video for you. Until then, you'll have to enjoy the artwork instead and you can enjoy the magic another time.